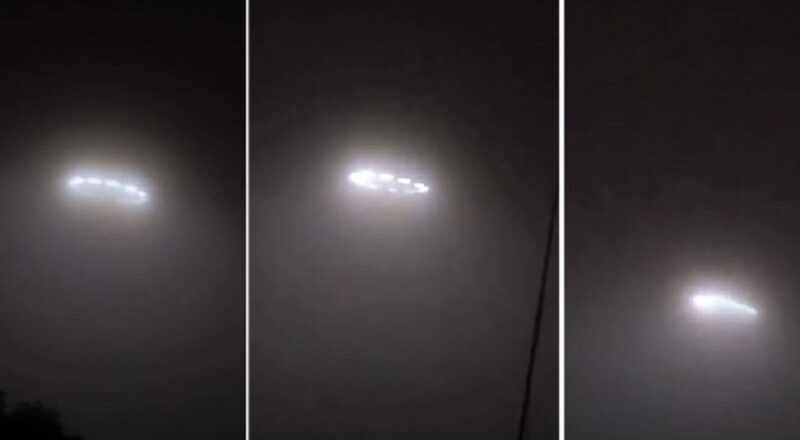 INCREDIBLE TRIANGLE VIDEO FROM MARGATE CITY N.J.
We came home from dinner and I looked in the sky and said what are those four bright lights in the sky all in a straight line . I thought this was crazy and unusual and asked my daughter to film it. Many lights and shaped came out of these four lights and then they formed a straight line again. This went on for about ten minutes. We felt dizzy and light after the sighting . And felt very weird, hard to explain. This case was investigated by Chief Investigator Ken Pfeifer and was classified as unknown uav. Boarded in Seattle Alaska Flight 3488, Nov 10, 2017, at 9:45 am. While in the air, I was staring out the window and I recalled an interview of a guy who said he “beams” to UFOs to come to him. So I half heartedly “beamed” out and asked any local UFOs to show themselves! None appeared to show up that I could see. However, I looked out the window and I saw what looked like the sunlight bouncing around the clouds in a stunning manner. I snapped some pictures and some video. We were about 30 minutes into the flight and I took the pix at about FON.COM CASE FILE10:12 am. 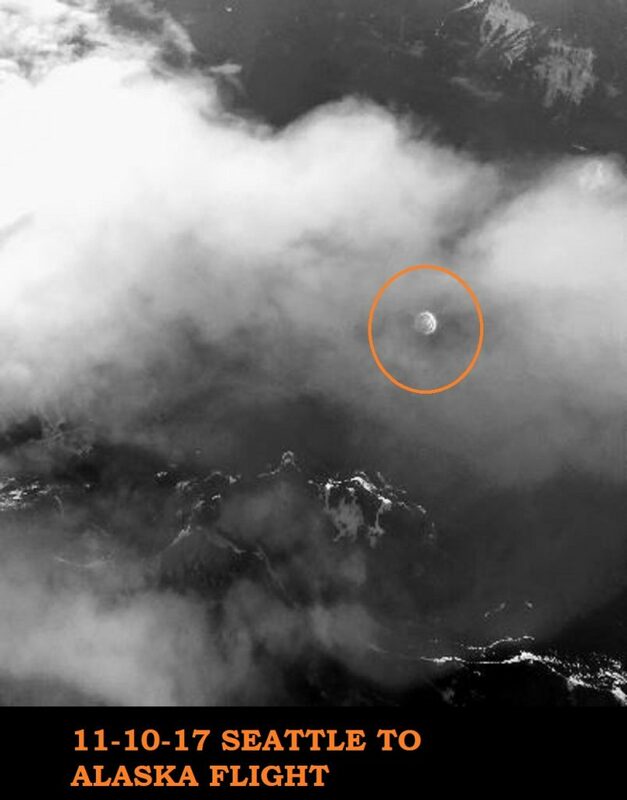 When I landed, later I looked through my photos and I saw this object that appeared to have some smoke, or steam or somehow in seemed to be popping into our atmosphere. 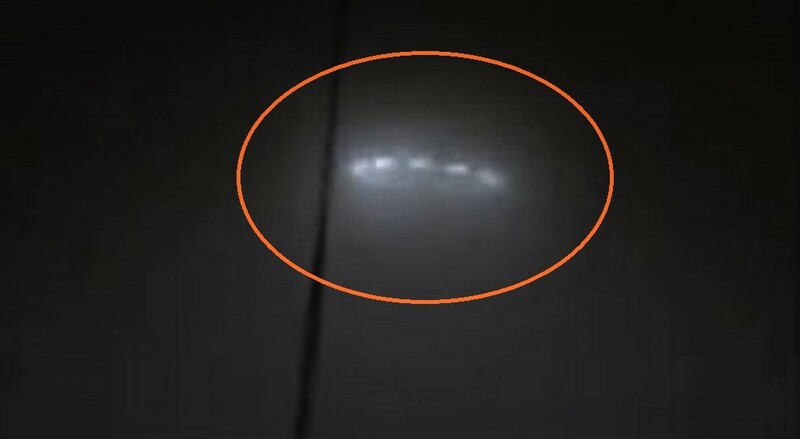 In the same minute seconds before, you can see something that appears to be a partial formation of this object. I did not see it with my eyes. When I enlarged it, I could see lines and some kind of dots on it. The pictures are real and I have no explanation for them at all. I asked others and someone told me about a dome planetary object in southern Idaho, but, we were in Washington. I found that dome and it isn’t the object in my picture. 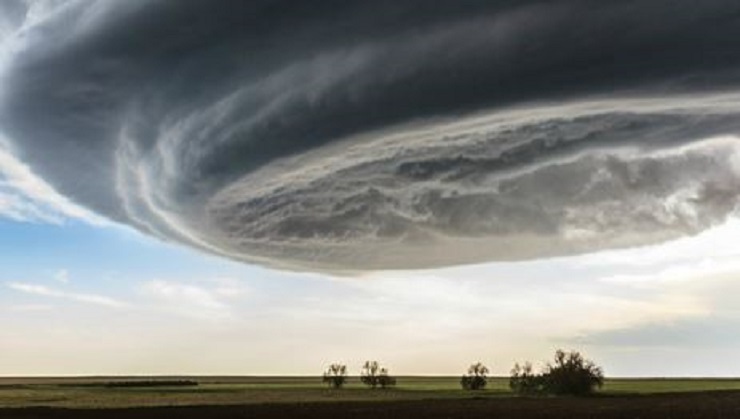 If you look carefully, the clouds are in front and in back of the object; which rules out something on the ground. I only saw the bright objects that I assumed were the sun bouncing around. Perhaps it was in infrared I can only speculate. For the record, it seems UFOs come up in my life once in a while. 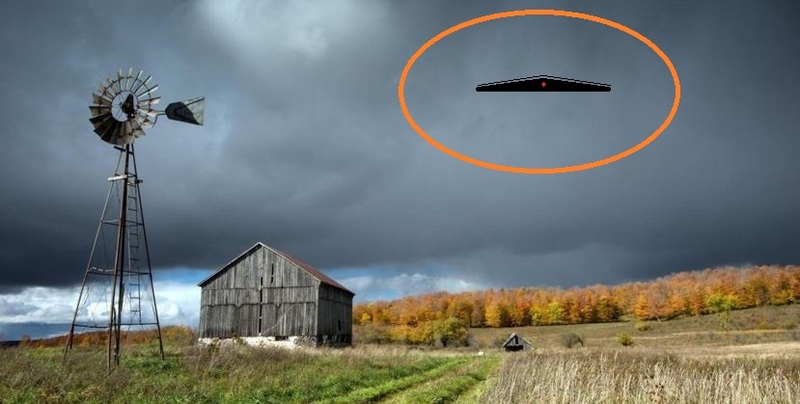 This year, Nov 14, 2018, I had a disturbing dream regarding UFO’s and climate change that has me wondering what is going on. The dream has nothing to do with last years pictures. Thank you! Sorry I waited so long to report this. KENS NOTE: Many times our today’s cameras can see what our eyes cannot see. With the modern phone/camera phones that everyone is carrying around, some of them have very high mega pixel capabilities with over 20 meg. This means you can take a dot on a photo and enlarge the photo to reveal incredible images. I had just arrived at the Brendan T. Byrne Campground after a long 15 mile hike on the Batona Trail. It was a very dark night, the campground was completely dark, and I was hiking alone with no one else in the there. As I was searching for a good camp spot, near sites 54/56, I happened to notice an odd and unique looking set of pulsating lights up in the sky to the northwest through a break in the forest canopy above the campground road. The lights pulsated very rapidly with various colors. I was fascinated by the appearance of these lights, which I have never seen before. (I grew up near the Philadelphia International Airport and have witnessed many planes landing during the day and night.) The color of the lights very rapidly shifted. There were 3 lights forming a triangle, all moving at the same rate and velocity. I could not see any craft or solid object. The object made no apparent noise. Earlier and later airplanes in the sky made noises and looked completely different and further away. I attempted to take a video of whatever it was on my iPhone, but it was too dark and nothing showed up. (It was also difficult to aim the phone correctly, and the sighting didn’t last long enough.) Listening to the video, I can hear crickets and very distant car sounds but nothing else. The object moved at a steady velocity and didn’t change direction. It moved to the northwest until I couldn’t see it anymore above the forest. 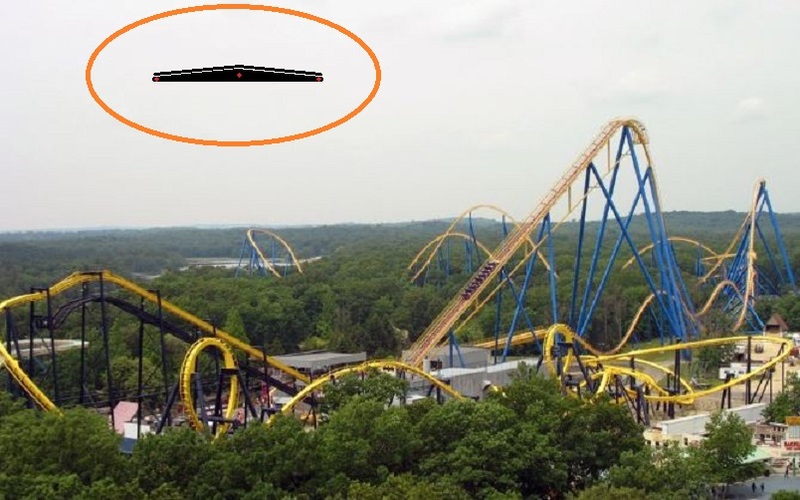 It was definitely just above the forest canopy, but didn’t appear more than approx. 1-2 miles or so away. It appeared so low that it was right above the forest northwest of my position. NOTE: The above image is CGI. This case is so complex and interesting, it warrants having a full newsletter devoted to describe it completely. However, since the person who reported the incident occupies a responsible position, and therefore doesn’t want to be identified, I just touch on it here. In the early morning hours of Tuesday, March 28, a person departed work to drive home, a distance of approximately 15 miles. 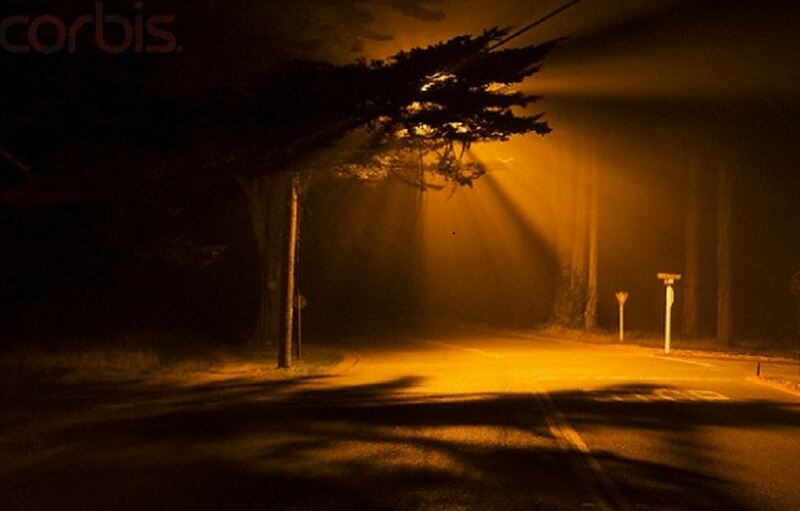 The observer was suddenly jolted to full alertness when a “clump of “fog” flew across the road in front of the car the observer was driving. To condense a very long and detailed report, that “clump of fog” orbited around the car six times, stopping just above and ahead of the car’s front, right fender after its sixth (presumed) orbit. This was only a prelude to subsequent events, during which the observer vaguely recalls perhaps witnessing two craft sitting on the ground beside the road the person was driving on. 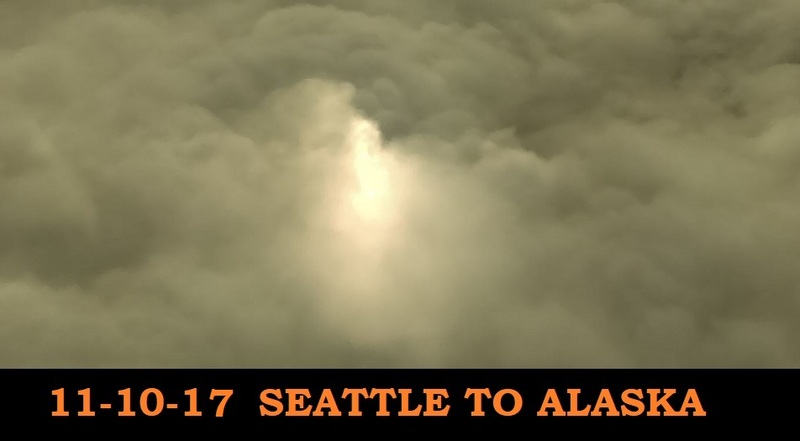 In strong support of this call from Alaska, the Center has received two articles from newspapers in Florence, OR, and San Francisco, CA, describing sightings on the same night as the alleged sighting in Alaska. 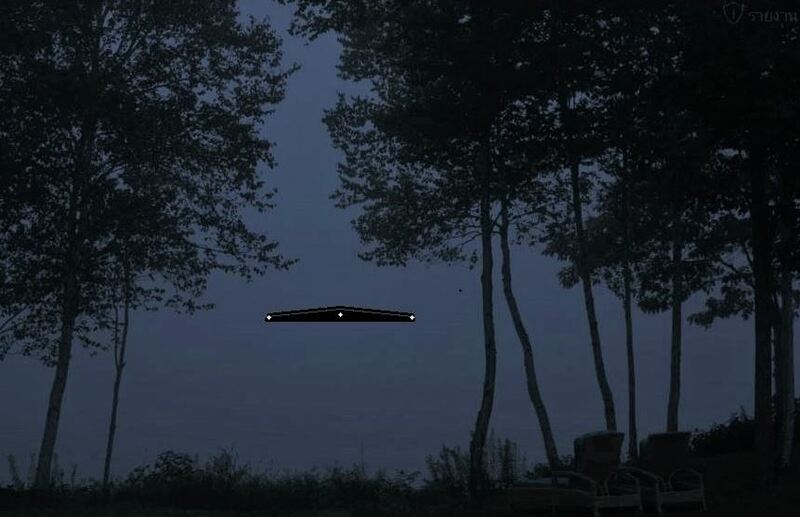 The object sighted in Florence, OR, was reported to hover over that coastal town for 10 minutes. The objects in California were reported to be “meteorites” streaking horizontally (!) to the south over the ocean off San Luis Obispo. NOTE: The above image is CGI. I was driving by my old house through my old neighborhood when I saw this object moving very fast tward my direction it stopped abruptly in mid-air descended to between 300 and 500 feet in altitude and it was about 350 to 500 ft from me in linear distance. It was a strange kind of black Like a gunmetal black it had four lone red stars on it one on each wing and one on each what looked like vertical stabilizers It didn’t make hardly any noise except for a a faint humming sound. It just sat there and hovered slowly turning for about 30 seconds and it just took off like bullet. it looked like something like a cross between a B-2 bomber but far more advanced and of a sleek double cranked Arrow Delta design. what impressed me was how fast it accelerated it literally went from 0 to probably Mach 3 in less than a second and when it did there was this incredibly loud boom like thunder sound and then it just faded from site. I’m kind of familiar with planes but I’ve never seen anything like this. NOTE: The above image is my CGI.